Divine Power was officially Established on September 25th of 2004, when Daniel (Bass Vocalist), literally contacted Mr. Connor (Baritone), F. Richards (Lead) and Mr. S. Landefort (Tenor) to form a group. In May of 2005, Divine Power consisting of Daniel (Bass), Connor (Lead), Samuel (Baritone) and Landefort (Tenor), guest-starred with the legendary Percy Sledge for a mother's day concert at Galis Bay Auditorium on French St Martin, and rocked the house with their remake of "When I Need Love". Divine Power made such an impact, that among their admirers; one of the local French Hoteliers immediately hired the group for their weekend entertainment program. In 2006 Divine Power auditioned with other prominent groups of St. Maarten, to decide who would represent the island in an upcoming Praise Fest competition; participants came from many of the neighboring Caribbean Islands, Suriname, Dominican Republic as well as The USA. 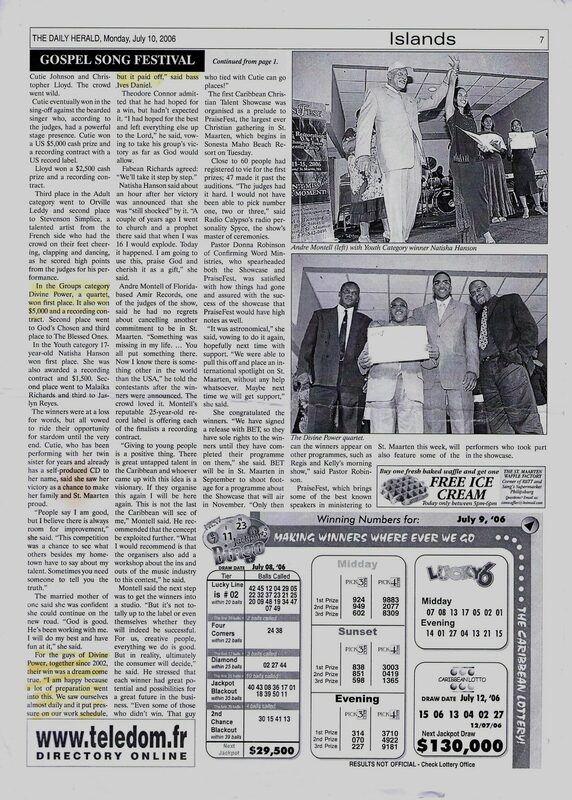 Consisting then of Richards (Lead), Kelly Magloire (Deceased; Tenor), Connor (Baritone) and Daniel (Bass), Divine Power went on to win the Praise Fest Tournament in the groups category in June of 2006 along with a recording contract with Verity of Sony Records, of which are the likes of Kirk Franklin, Donny Mc Quilkin and Yolanda Adams etc. Among the judges who declared Divine Power winners, was Mr. Montell, the owner of Florida based Amir Records, of whom its been said to have helped launch the career of the likes of Sir Elton John (among others). Mr. Montell who was so impressed of Divine Power’s ability to compete and win in the praise fest, without music, asked the group to record something “with” music as to ascertain how the group would sound “with” music. The group then got together and decided to be even more impressive by “writing” and playing the music to their “own” song. Daniel took an old instrumental flow of chords he would play for personal entertainment on his guitar and got together with the group on his back porch and together wrote the lyrics and incorporated the musical arrangements; and the group literally compiled their original song entitled “Go Down”. The guitar instrumental/soloing in the song was done by Daniel on his guitar, whilst the keyboard and percussions were done and incorporated by the legendary musical genius himself, the deceased, Mr. Kelly Magloire. Divine Power received their 30 odd page musical contract from Sony Records, but were disappointed to learn that their start up finances, that was promised to them, would not be paid to them until the group first proved themselves successful in the music world. This placed most of the members in a predicament where they could not give up their jobs without any guarantee of how they would support their families or pay their loans. This set back demotivated the group that had worked so hard, in addition to the disappointment of the representatives and organizers of Praise Fest. However, on Sept 25th of 2016 as they got together for Daniel’s birthday bash (And Divine Power’s 12th Anniversary) , a spark was lit that reassembled the group to be here today with two new additions as Connor has relocated and Mr. Magloire is now deceased. So once again, we present to you St. Maarten’s own Divine Power; Accapella and Musical Entertainers !